Free live music, Wednesday through Saturday nights! This historic building sits on the northern edge of central Salem — Oregon's state capital. Enjoy McMenamins' pub food and handcrafted ales, wines and spirits in our brick-and-wood interior, or head outdoors to the shady beer garden. Boon's Treasury allows pets at our front patio only. 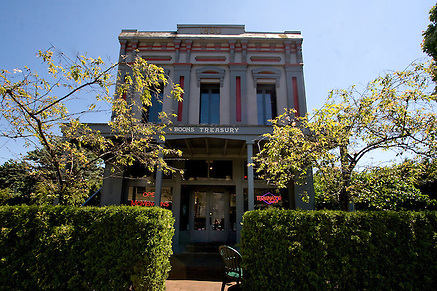 Boon's Treasury has been a popular gathering spot from the time Oregon became a state. Few other places in the Northwest can boast such a pedigree. It began as an island venture brought about by a man named John D. Boon. A devout Methodist, Boon came to the developing site of Salem in 1845 to work with the Jason Lee Mission. In 1851, his honest character led to Boon's election as Oregon's first treasurer, a position he kept into the 1860s. During this time, Boon also started his own general store — the second in Salem. He conducted both state and store business in the brick building he constructed on the island formed by the encircling waters of Mill Creek and the mill race feeding the Mission's mill. Boon's store became a favorite trading place, and continued as such into the 20th century under its new proprietor, a prosperous adventurer named William Lincoln Wade. Wade not only kept store business brisk, he also opened the building's upper story to serve as a community hall. One frequenter of Wade's store was future president Herbert Hoover, a childhood friend of Wade's son. With the repeal of Prohibition in 1933, the one-time treasury was transformed into a "beer parlor" by Fred Karr, a former hop grower and bowling academy director. The long run of Karr's Tavern stretched into the 1970s, when it was sold and reopened as "Boon's Treasury," still a neighborhood pub, but one that featured live music played by such masters as Earl 'Fatha' Hines. 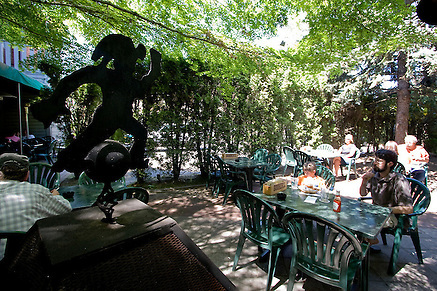 In 1998, the torch was passed to McMenamins and we have continued the pub's live music tradition, all the while striving to maintain the historic building's longstanding status as a favorite hub.